A score of wind-fueled wildfires broke out overnight in California’s Sonoma and Napa counties, burning tens of thousands of acres, destroying 1,500 structures and causing tens of thousands of residents to flee their homes and businesses. At least 15 people are dead due to destructive fires in Northern California. Seven deaths have been reported in Sonoma County, while two have been reported in Napa County. One person has been confirmed dead due to the Redwood Valley Fire in Mendocino County, according to the San Francisco Chronicle. Two people were reported to be seriously injured, due to the raging fires, a Department of Forestry and Fire Protection (CalFire) chief told KABC on Monday. Governor Jerry Brown declared a state of emergency for Sonoma, Napa and Uva counties on Monday. The declaration authorizes the mobilization of the California National Guard to the wine country, north of San Francisco. CalFire Director Ken Pimlott said at a news conference in Sacramento that an estimated 20,000 people have been evacuated in eight counties in Northern California, while stating that firefighters have “limited or no containment” on the fires, the Chronicle reported. 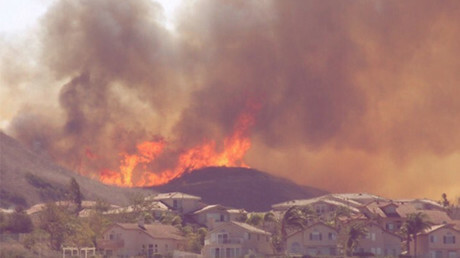 There are also separate fires in Southern California in Anaheim Hills, though no reported deaths have surfaced yet. Command centers are being set up by first responders in order to handle the multiple fires. The first wave of logistic crews are creating a command center for the Atlas Peak fire, at the Napa County Expo Center, located in Napa. The Tubbs Fire in Santa Rosa has grown, and has now burned an estimated 27,000 acres in the area, while two Santa Rosa hospitals have been evacuated, the Los Angeles Times reported. The city of Santa Rosa imposed a curfew of 6:45pm on Monday, to last until sunrise on Tuesday, in order to prevent looting, according to an official from the city, the Los Angeles Times reported. The evacuation zone is larger than the burn zone in Santa Rosa, resulting in many houses that are empty, acting Santa Rosa Police Chief Craig Schwartz said. 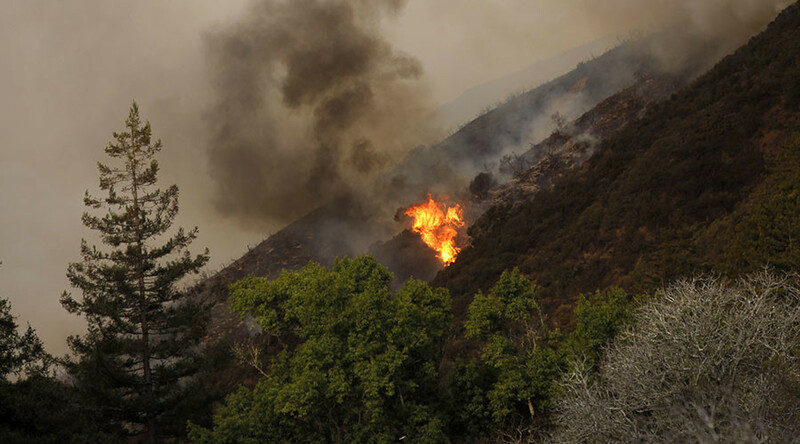 “We have had a number of reports in the evacuation zone and the fire zone of people driving around and suspicious behavior,” Schwartz said, the LA Times reported. He did not know of any arrests being made in connection with alleged looting. The Contra Costa Fire Department came to Santa Rosa to help out with the destruction the fires have caused in the city. Unnamed firefighters from this department told KGO there had been looting in the Santa Rosa neighborhood. An Oakland police officer also came to Santa Rosa to help the city, and said he is on the lookout for potential looters, KGO reported. One fast-moving fire jumped the 101 Freeway, forcing a hospital in Santa Rosa to be evacuated and burning homes and businesses, witnesses said. All public schools in Santa Rosa and Calistoga have been closed Monday. Residents described terrifying middle of the night scrambles to flee from raging wildfires. There was “zero containment” on two of the biggest fires, Cal Fire said in a mid-morning briefing on Monday. The Atlas Peak fire near the city of Napa had burned more than 10,000 acres by 6 am. Cal Fire is keeping track of three other fires in Napa, Sonoma and Lake Counties. 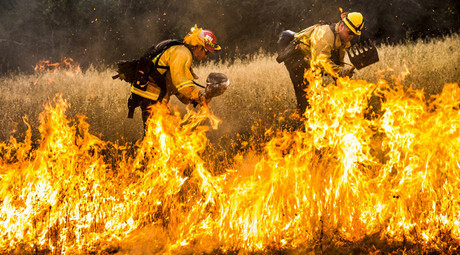 Upwards of 300 firefighters are battling blazes in Napa County. Three evacuation centers have been set up. Marin County sent 22 fire engines, five ambulances, and dozens of crew to assist the Napa and Sonoma firefighters. The area of Fountaingrove was particularly hard-hit, with photos showing numerous homes on fire. Some evacuation centers are already filled to capacity due to the large number of residents forced to flee. Wind has been a major factor in fanning the flames, with gusts of 46-79 miles per hour causing the fires to spread. Smoke from the conflagrations could be sensed as far as San Francisco, Oakland and San Jose. What caused the fires is still under investigation. Similar wildfires rages across the area in August 2015, when 12,000 residents were evacuated and 60,000 acres went up in flames, after drought conditions and winds left firefighters struggling to contain the outbreaks.